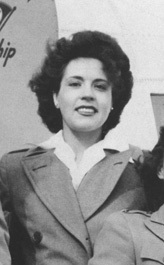 This picture was captured from a photo of several WAFS found on page 25 of "WASPs: Women Airforce Service Pilots of World War II", by Vera S. Williams. From several references I was able to find the following. Esther Manning Shively joined the WAFS on 10/22/42. Esther was stationed at New Castle Army Air Base in Wilmington Delaware. From this base, the WAFs ferried PTs, ATs, pursuit planes, and C-47s. 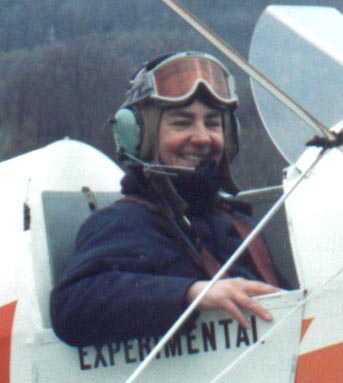 In one reference, a WASP Ruth Adams was flying as copilot with Esther in a UC-78. Just after take off, Ruth notices smoke from under Esther's seat. They followed standard emergency procedures and landed safely in a farm field. Later evidence was found that some insulation on wiring for the landing gear had burned. In another reference, she is pictured with Nancy Love and three others and they are all referred to as "squadron leaders." In a book with a reference to 4/27/43, there is this statement, "Esther Manning Rathfelder no longer flies anything but a desk at New Castle." She and another WASP were pregant. This picture of Esther was provided by Don Peterson, her son-in-law. 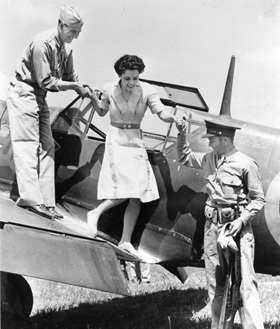 Don married Bonnie Shively, the daughter of Esther, who eventually became the second generation of female pilots for the family. Bonnie is shown below in her beloved Stampe "Rocinante". Unfortunately, Bonnie was killed while flying this plane on 7/20/98. Despite this loss, Valerie Shively, Bonnie's niece, has taken up flying - the third generation. On Sunday July 21, 2003, a collection of Esther's personal letters and newspaper clippings were found at a moving sale in Unionville, in Orange County NY, close to where some of the Mannings family resides, by Anna DiVito. The residence these papers were found in was about to be sold and its contents just dumped in the trash. One of the former tenants, John Wicks, had had an antique shop on the second floor and this is where Anna found the papers. Anna's main interest was to see the inside of this old history home and she was looking for interesting material that might spark a book idea. These documents were almost lost forever. The drawer contained personal letters from her daughter's Bonnie Shively Peterson and Julie Shively as well as from her son, John, mother, and other friends, colleagues and college associates. Anna provided these documents to Julie and Julie would like to know anything about her mother that you could provide.